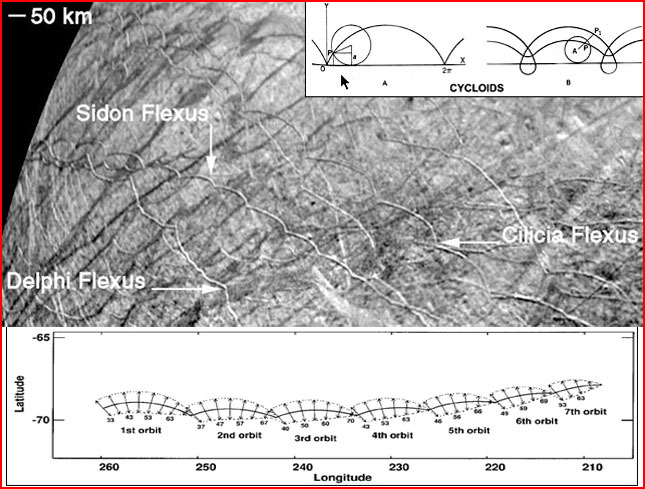 For many years, the looping rilles on Europa were called “fractures”, but the model developed to explain them only highlighted the failure of the underlying interpretation. The picture above shows a series of “cycloidal” grooves cutting across the surface of the Jovian moon Europa. The longest extends more than 1600 kilometers and each of its many loops averages about 100 kilometers in length. (To envision a cycloid path, imagine a spot on a wheel rim as the wheel rolls along a flat surface (see inset). The path traversed by the spot combines two kinds of simultaneous motion—rotational and linear). Though NASA scientists never doubted that these prominent features were surface cracks or “flexi”, the unique form posed a great mystery to them. But that situation changed when Randy Tufts, a geologist at the University of Arizona, proposed an explanation. He suggested that the oddly replicated curvature of the cracks was caused by changes in the gravitational tug from Jupiter in the course of Europa’s 85-hour orbit of the gas giant. Because Europa keeps the same face toward Jupiter, a Europan orbit is the same length as a Europan “day”. Tuft’s suspicions inspired orbital dynamicist Gregory Hoppa, also of the University of Arizona. Assuming an ocean of subsurface water, he produced a computer model of looping cracks in the Europan ice sheet. The fractures were caused by tidal forces acting on the water below, he said. Scientists greeted the paper as an “elegant” breakthrough. But was it a breakthrough, or another example of computers simply spitting out the results they were programmed to deliver? Computers are, after all, the generators of virtual reality. The repeated loops on Europa have no analog in observed fracturing patterns of brittle material. When ice cracks, the fracture typically propagates at the speed of sound. But to match Europa’s slow rotation, the computer model required something never observed—an ice fracture propagating at a walking speed of about 3 kilometers per hour. Fracturing of ice is chaotic and profoundly affected by variations in thickness, composition and surface relief. But the model allowed for no such influences. On Europa, everything present on the surface before the cycloidal grooves were cut had to be ignored by the computer—even the maze of pre-existing channels traversed by the loops. Was this a reasonable simplification? Consider the way a sheet of glass breaks. The presence of a shallow groove left by a glass cutter is sufficient to control the direction of a break. Fracturing ice could hardly ignore preexisting channels on Europa! The model assumed a global ocean beneath the ice so that tidal bulging on Europa could reach nearly 100 meters (330 feet) at maximum. That may sound like a substantial distance, but in relation to the radius of Europa, which is larger than our Moon, it is trivial. In Europa’s tidal bulge, tensile stresses on a global ice sheet would be dispersed over hundreds of kilometers. Ice is quite plastic when stresses are applied slowly. There is no reason to believe that across such distances a sheet of ice could not make the imperceptible adjustment required. Other arbitrary assumptions were needed to make the model “work”, and most strayed far from facts already established. In order for cracks to form, the computer model required a maximum ice sheet thickness of about a kilometer. But some of the surface channels cut by the loops are several kilometers deep. Had the computer program included this fact it would have broken down immediately. But the manipulated data gave the desired result, enabling science writers to complete the circular logic: the model became “a powerful argument that an ocean of water underlies Europa’s crust”. In the model each loop represents a Europan day. On this reasoning, the longest flexus must have formed in about a half month. But if this is evidence of an ocean today, why are there so few flexi? By now all other features should be obliterated by the effects of the daily cycloidal forces. To produce the succession of loops, the cracking had to stop after each loop, then resume from that precise point on the next orbit. In fact it is extremely difficult to discern the “rules” the computer was instructed to follow. Delphi Flexus and its neighbor, Sidon Flexus have opposed curvatures, requiring that the “cracks” progress in opposite directions. The computer program must have allowed for this variability even as it required the “tensile stress vectors” to seamlessly extend the fracture from “day” to “day” on Europa. One thing should be obvious. The forces that created the Europan enigmas are not acting on the Jovian moon now. To simply acknowledge this fact would go a long way toward freeing science from the influence of ideology. But will NASA’s experts pause long enough to entertain a simple electrical hypothesis? We claim that Europa was repeatedly entangled in discharge streamers emanating from Jupiter. Since ice is more homogeneous than rock, the surface discharges on Europa tended to produce relatively straight rilles following a strong electric field along great circles from the sub-Jovian hemisphere (the hemisphere facing Jupiter) to the opposite hemisphere. That is the general pattern. However, circular motion of an arc can be demonstrated in the lab when a magnetic field lies parallel to a cathode surface. We are confident that something of this sort occurred in Europa’s electrical transactions with Jupiter. Occasionally, the powerful magnetic fields carried by the discharge streamers draped over the moon's surface, inducing a near-surface electric current and magnetic field in the ice. As in the laboratory experiments, this would cause the traveling electric arcs to rotate in cycloidal fashion, producing the distinctive looping furrows. In response to changes in the strength of the ambient magnetic field, the loops in these cycloidal rilles would, as now observed, display a slowly changing radius of curvature. What is needed in the case of Europa’s surface mysteries is not an arbitrary computer-generated “solution”, but practical experiments to test a new hypothesis. Can electrical discharges produce the rille patterns seen on Europa? The required experimental work is easily within reach if NASA’s investigators will follow evidence already in hand. The resulting insights could change the direction of planetary science. They could also inspire something our space program lost under the inertia of outdated theory—the passion for discovery.